HOST: Redwood Coast Chapter U.S.L.A. REGISTRATION: On site registration from 7:30 am to 8:30 am on Wednesday, July 23rd. A participant waiver must be signed by each competitor. Minors require a legal guardians signature. CAMPING: Available to competitors for free at the group use site on July 22nd, and July 23rd. WET SUITS: Wet suits will be allowed during the competition for all events. In partnership with Bodega Bay Surf Shack, wet suits will be available at 1/2 price rental on July 22nd and July 23rd. Mention the Northwest Region Lifeguard Competition to receive this rate. 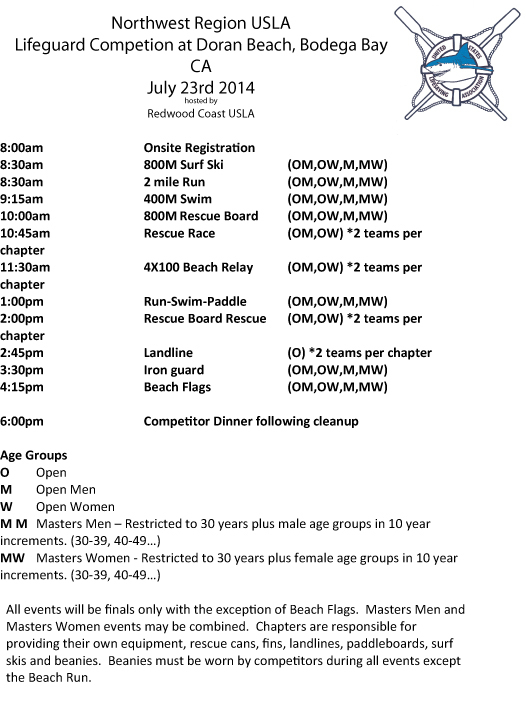 All participants must be an active USLA member. To become a member, follow this link to the USLA site. REGISTRATION: On site registration from 7:30 am to 8:30 am on Wednesday, July 25th. A participant waiver must be signed by each competitor. Minors require a legal guardians signature.